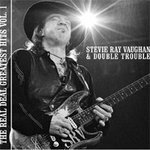 Subject – Stevie Ray Vaughan – Real Deal: Greatest Hits, Volume 1 – a 2006 release on Epic Legacy Recordings, with Cover Photography by Robert M. Knight. A 1982 performance of his band Double Trouble at the Montreaux Festival caught the eye of David Bowie, who asked Stevie Ray to play on his new album Let’s Dance. This was quickly followed by a record deal with Epic and the release of the band’s first album, the chart-busting Texas Flood. That record was followed up by a quick succession of others (Couldn’t Stand the Weather and Soul to Soul), along with the band’s embarking on a relentless tour schedule. This continued until 1987, when Vaughan’s drug and alcohol use caught up with him and he checked himself into rehab. After this much-needed break, the band continued to tour (although at a slower pace) and then released their most-successful album – the Grammy-winning In Step – in 1989. 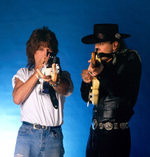 In the spring of 1990, Stevie Ray and his brother Jimmie (of Fabuous Thunderbirds fame) recorded an album (Family Style) which was scheduled for release in the fall of the year. Then on August 26, 1990, after the band played an Alpine Valley, WI show (which featured a “guitar superstar” encore jam of “Sweet Home Chicago” played with brother Jimmie, bluesman Robert Cray, and SRV’s guitar idols Buddy Guy and Eric Clapton) on a warmly-received American tour, the 35-year-old Vaughan boarded a helicopter headed for Chicago. Minutes later, the helicopter crashed and killed Vaughan and 4 other passengers. This image of Stevie on stage in Minneapolis was one that had been fooled with early on using a process I developed in the late 60’s using "Kodalith" film in special chemicals that prevent the silver halide from linking together - giving the illusion of blackness - but the dark areas are actually made up of the actual grain of the film. I only got to know Stevie when he was sober. A lot of time, he would come into Los Angeles, give me a call and we'd just hang out and talk. Stevie basically died of drugs and alcohol 6 years earlier in Switzerland and after rehab he became sober and came back to life and was walking, I feel, “in the light”. Whenever I photographed him, I tended to get shots of Stevie in “The Light”. Later this year, to commemorate the 25th anniversary of SRV & Double Trouble’s debut at Montreaux, Epic will be releasing a newly-remastered re-issue of the 1990 DVD package titled Pride and Joy that, according to the label, “has been updated, upgraded (to new Stereo and 5.1 surround-sound mixes), and expanded to more than twice its original length. The new DVD edition of Pride and Joy reprises the original eight segments, and now adds a bonus promo video clip (“Little Wing”), three acoustic numbers from the original MTV “Unplugged” series, two television commercials, and performances with Stevie Ray’s older brother Jimmie in the Vaughan Brothers (along with the EPK created for that band). The new 17-track DVD will arrive in stores November 6th on Epic/Legacy, a division of SONY BMG MUSIC ENTERTAINMENT." Robert is also part of Guitar Center’s "Hollywood RockWalk" team, working alongside RockWalk director Dave Weiderman. Robert and partner Maryanne Bilham have an exhibition of 10-foot-tall photos on the outside of the more than 200 Guitar Centers around America., making it one of the largest outdoor gallery shows of original photographic art. All other text Copyright 2007 - Mike Goldstein & RockPoP Gallery - All rights reserved. In a summer of love 1970 he formed his first band in the long term, the Blackbirds, with Stevie and Kim Davis on guitars, Christian dePlicque on vocals, Roddy Colonna & John Huff on drums, Noel Deis on keyboards and David Frame on bass. At the end of 1971 left high school and moved to Austin with his band, establishing his base at a club called "Country Club Hills." The club was Rolling Hills and I started the band with Charles De'Plique,David Frame,and Stevie. 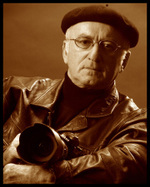 Roddy - thanks so much for the clarification - so nice to hear it "straight from the horses mouth". Hope that you enjoyed the article - if you have any other comments, please feel free to add them! Roddy - Was Rolling Hills out on Bee Caves? Alex Napier's place, right?